Pakistan held a ceremony to celebrate the 549th birth anniversary of Baba Guru Nanak Dev Ji at Gurdwara Janamasthan November 24, 2018. Federal Minister for Religious Affairs Peer Noorul Haq Qadri has said that Baba Guru Nanak Dev Ji, the founder of Sikhism, gave the message of humanity and brotherhood. He said that saints of the sub-continent gave the message of peace and brotherhood and it was the reason that Muslims, Sikhs, Christians and Hindus sat together on the table of free food (Langar) at the shrine of Khawaja Moinuddin Chishti at Ajmer Sharif. The minister said: “Hug between COAS Gen Qamar Javed Bajwa and Indian politician Navjot Singh Sidhu has played a vital role in the opening of Kartarpur border and such more hugs can bring both countries closer to each other.” He said: “We are proud of COAS Gen Qamar Javed Bajwa who gives the message of peace.” He said that Prime Minister Imran Khan was serious to resolve all issues through dialogue. Leader of Delhi Gurdwara Parbandhak Committee Sardar Param Jeet Singh Sarna said that good relations between Pakistan and India were vital for peaceful coexistence. He hoped that nearly 50,000 Indian Sikh Yatrees would visit Gurdwara Janamasthan, Nankana, after the opening of Kartarpur border. 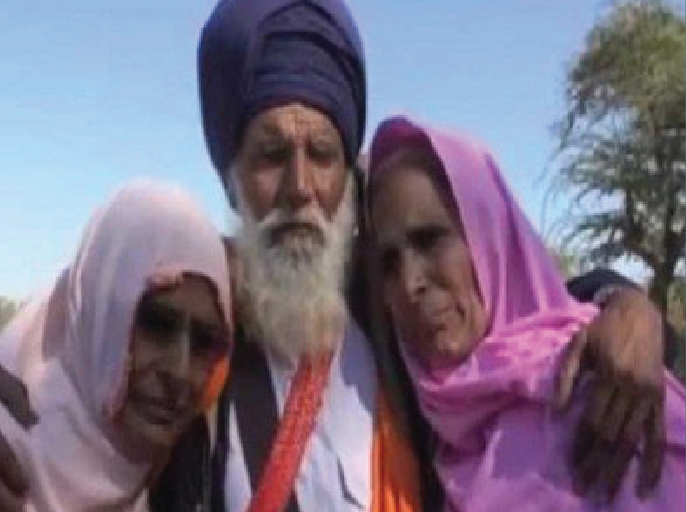 Two Muslim sisters – Ulfat Bibi, Mairaj Bibi – hugged and greeted their Sikh brother Sardar Bayanth Singh whom they had not met after over seven decades. Mairaj Bibi of Shahdra and her sister Ulfat Bibi of Sheikhupura Lahore told reporters that their parents used to live in Paracha village near Dera Baba Nanak Gurdaspur (India) before the 1947 Partition. They said before their family members migrated to Pakistan their elder sister and a younger brother who was one and a half years old at that time went missing. The mother, Allah Rakhhi, later contacted one of her former neighbours and found out the whereabouts of her son, Beant. The sisters said they contacted their brother through postal and telephone assistance. Ulfat and Miraj also appealed to Pakistan prime minister Imran Khan to extend their brother’s visa. Pakistan and India have decided to open the Kartarpur border corridor to facilitate Sikh pilgrims visiting one of their holiest sites on the banks of River Ravi in a move that analysts say might thaw the frosty relationship between the two neighbours. The Prophet said, "A time will come when one will not care how one gains one's money, legally or illegally."